At Family Health Professionals Helensvale, our family health practice is ready to welcome you into a relaxing and comfortable environment for the whole family—your little ones are welcomed with toys, books and colouring pages to make their time with us enjoyable. We know our patients lead busy lives, which is why we always aim to keep your appointments as efficient and timely as possible. During your first visit to our practice, your chiropractor will do what we call “fact finding.” During your time together, your chiropractor will talk about what issues have brought you in and what your concerns are. Your chiropractor will then perform a couple of exams, including a non-invasive physical examination and X-rays, which are conveniently located in our practice. Once these initial tests are conducted we will then schedule a further appointment to discuss the type of care you require as we will have a clearer understanding of your needs. Please arrive 10 minutes prior to your scheduled appointment time so that we can complete your documentation. No referral is necessary and direct claiming from your private health insurance is available. 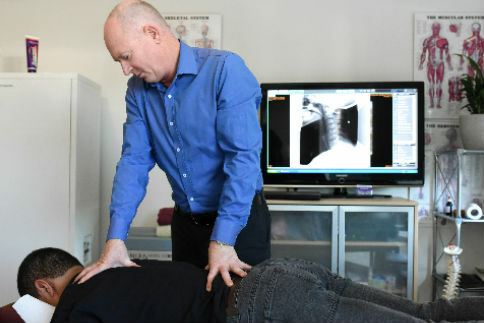 Your chiropractor will discuss the findings of your initial appointment and x-rays with you in detail. We want you to be in-tune with your body and understand as much about how chiropractic care can benefit you as possible. If you are happy to proceed we will begin your chiropractic care on this visit. Regular visits with us are significantly shorter than your first two appointments. We will continue to monitor your progress to determine how you are responding to your treatment and make the necessary chiropractic adjustments. Our aim is for you to be and feel as comfortable as possible — if you ever have any questions, we encourage you to ask! Once your initial schedule is complete your chiropractor will recommend a maintenance schedule to decrease the chance of reoccurrence of your presenting concern. Maintenance care is, however, entirely up to you. It’s our goal to help each patient and their family feel and live as healthy as possible. Let our highly skilled and dedicated team at Family Health Professionals assist you in your journey to optimal health. To schedule your first appointment, contact us today. We look forward to assisting you on your journey to wellness.